It always amazes me when I hear people say they “forgot to eat” on a particularly busy day. This concept is completely foreign to me. I have had busy days. I’ve had days where I’ve had to push back a meal or skip it in favor of scarfing a granola bar down in the car. But I honestly can’t remember a single time where I’ve just “forgotten” to eat. When I’m hungry, my body makes it awfully hard to forget. Those loud, angry stomach gurgles aren’t going to wait. The term “hangry” has enjoyed a lot of success the past few years, at least partially because it’s a feeling so many people identify with. When I’m hungry I often find myself impatient and short tempered. I can easily snap at my husband or get upset about things that wouldn’t normally bother me. Hangriness isn’t a state that’s good for anyone–me, my family, or anyone unlucky enough to get between me and the sample ladies at Costco. But here’s the sad truth. There are many families, in your community and in mine, who don’t just “forget” to eat or have a mild case of the hangries one day. There are many who face hunger on a daily basis. We all know what hunger feels like, but imagine having that state drawn out for days or weeks at a time. Imagine the impact that would have not only on your own health, but on your family and your job. I know I find it difficult to focus when I have to push back lunch by an hour or two, but there are children in our city who are attempting to take tests and listen to their teachers on empty stomachs. September is Hunger Action Month, and I wanted to take the opportunity to share with you a local partner who’s helping bridge the gap for hungry families in our community. Last year, Lutheran Social Services Food Pantry distributed 2.1 meals to 81,000 families in 14 Ohio counties. Families can visit their pantry on a weekly basis and shop for 3 days worth of meals. The challenge of pantry shopping is, of course, that you never know quite what you’re going to get, although the pantries strive to always have fresh produce, protein, and emergency staples like canned goods and peanut butter on hand. When I think about NeighborFood, I think about organizations like LSS who are literally sharing food with our neighbors. In that same spirit, I wanted to share a recipe that could easily be made and adapted based on whatever a food pantry might have on hand. The recipe is really a dump and go favorite. 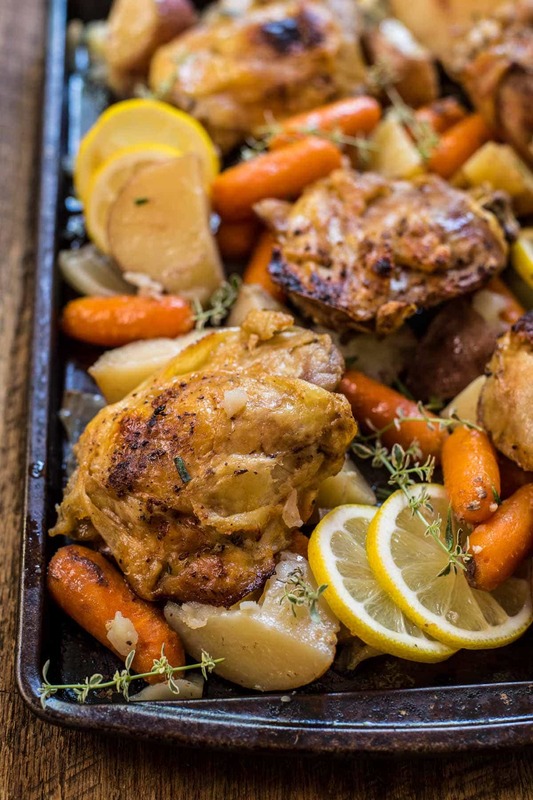 Place some potatoes, onions, and carrots in the slow cooker (feel free to substitute with what you have on hand), then place the chicken on top along with some olive oil, lemon juice, garlic, and herbs. You can swap the chicken in this for drumsticks or breasts and the fresh herbs for dried Italian seasoning if you prefer. After cooking, I like to pop the chicken under the broiler to get a nice crispy browned skin, but this extra step is optional. If you would like to help hungry families here in Columbus, please visit Lutheran Social Service’s website, or, for those of you who aren’t local, check out Feeding America to find out how to take action in your own neighborhood. Place the potatoes, onions, and carrots in the bottom of a large slow cooker. Sprinkle generously with salt and pepper. Stir in two cloves of garlic and half of the fresh herbs. Sprinkle the chicken thighs generously with salt and pepper then nestle them in with the potatoes and carrots. Pour the olive oil evenly over top, followed by the lemon juice and herbs. Place the lemon slices over top. Cook on high for four hours or on low for 8 hours. When the chicken is finished, remove the sliced lemon, squeezing it out a bit if you want extra lemony flavor. Preheat the broiled and place the chicken thighs on a pan under the broiler for 3-4 minutes or until browned and crisp. Serve immediately with the vegetables. This recipe can be easily adapted based on the ingredients you have on hand. 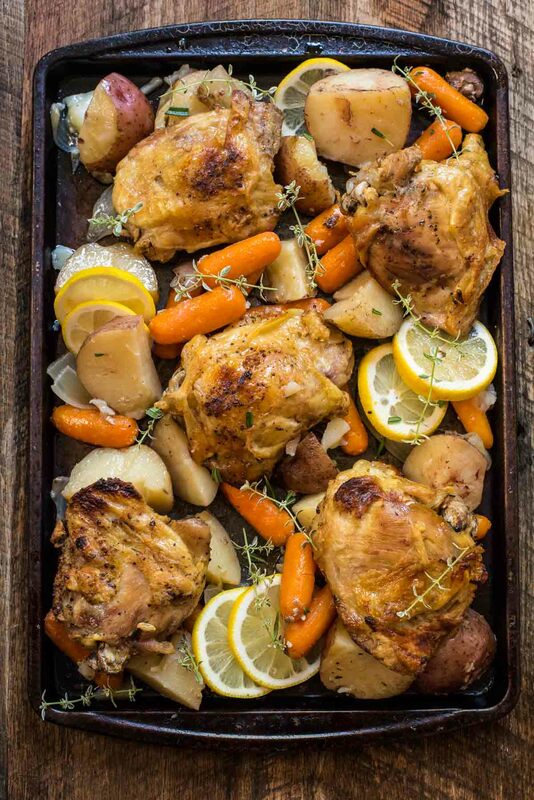 Feel free to use chicken drumsticks or breasts instead of thighs and use dried herbs (Italian seasoning or dried rosemary/thyme) instead of fresh. Yay! I’m so glad you liked it Nicki! can you cook this dish in the oven?? That should work fine! I would put everything on a foil lined sheet pan then bake at 400 degrees for 40-50 minutes. Covered or not for the oven?!? Can’t wait to try this tonight. I just didn’t have time to put it in the crock pot. I am recently widowed. Cooking for one has been a problem. But I will make this, package it, and have several meals ready to go. My husband retired three years before I did. He took over meal preparation. Didn’t realize how spoiled I was. I’m so sorry to hear that. I’m sure that is a really hard adjustment. I hope this recipe can help make your dinner times a little easier! Does the olive oil make it seem greasy? I personally haven’t run into this issue, but I have received one other comment about it seeming greasy. If you’re worried about it, feel free to omit the olive oil. Another reader did that and said it turned out fine! I found this recipe quite by accident and thought it sounded easy, nutritious, and delicious. I have just found your website and will be selecting other of your recipes from now on. This comment just made my day, Peggy. I’m so glad you enjoyed the recipe and hope you find many more favorites on the site! It should be fine to do it on high. I would check it at 4 hours to see if it’s done, and if not go the full 6. Hope you enjoy! What a wonderful recipe this is. I have not seen my family members in a various number of years and we all live most of the time in the same general area but work interferes. I will double this recipe this weekend and use a 5 quart crock-pot. Thanks and take care…. I’m so glad you like it and I hope your family will as well! Do you think it would be ok to use boneless chicken breasts in this recipe? I think you could try it, but I would bake the chicken breasts on a separate pan in case they get done before the rest of the meal. That way you can take them out early and avoid drying them out! I’m so sorry, I just realized I responded on the wrong recipe. I think you could absolutely use chicken breasts in this recipe without making any changes. I hope that helps! Hi, looks lovely but I am wondering if it wouldn’t be a bit dry with only oil and lemon juice? Won’t it dry/burn to my slow cooker? No extra liquid needed! The chicken will cook in its own juices. hi ,do we need to add water or ang liquid on the slow cooker pot ? No extra liquid is necessary! The recipe says to remove the leaves from the thyme. Does that mean you use only the stems? Also, should the garlic be chopped or go in whole? Sorry that’s confusing! I use the thyme leaves, not the stems. And the garlic can remain while, or if you have chopped you can use about a teaspoon chopped. Do you have any suggestions for reheating? After being in the slow cooker for 8 hrs, I had to pack it up for future meals. To reheat, I put in the broiler on high for 10min. Mine was fine, but my husband’s was pink. I put it back in for another 5 min in tented foil and then turned off the broiler and kept it in for a few more minutes (trying to avoid drying it out). It darkened up, but of course we are concerned about food safety. There wasn’t really a thick enough portion of chicken left to check the temp. Thoughts? Hmmm…pink is not necessarily a sign of doneness (or un-doneness). You could always try microwaving for a few minutes before placing in the oven to crisp up, just ot be sure. I notice that the recipe instructions say to stir half of the garlic and herbs in before starting to cook the meal. When does the remainder of these ingredients come into play? The time should be the same whether you use bone in or boneless! I made it twice and it was amazing both times! Awesome! Thank you so much for coming back to let me know! Sorry about that! The remaining 2 cloves go on top of the chicken! I’ve updated the recipe. What adjustments need to be made, if I want to double the recipe? As long as you can fit it all in the crock pot, you shouldn’t need to make any adjustments other than doubling all the ingredients! This recipe is so delicous. We’ve made this a couple times and it gets better everytime. I love the texture you get from the skin on chicken when it’s broiled as a last step. Pot recipe.i bought boneless skinless thighs, is that ok ? So you can place the uncooked chicken with the potatoes and carrots, correct? I just ask because I’m not super great with cooking chicken and I just wanted to make sure. That’s right! 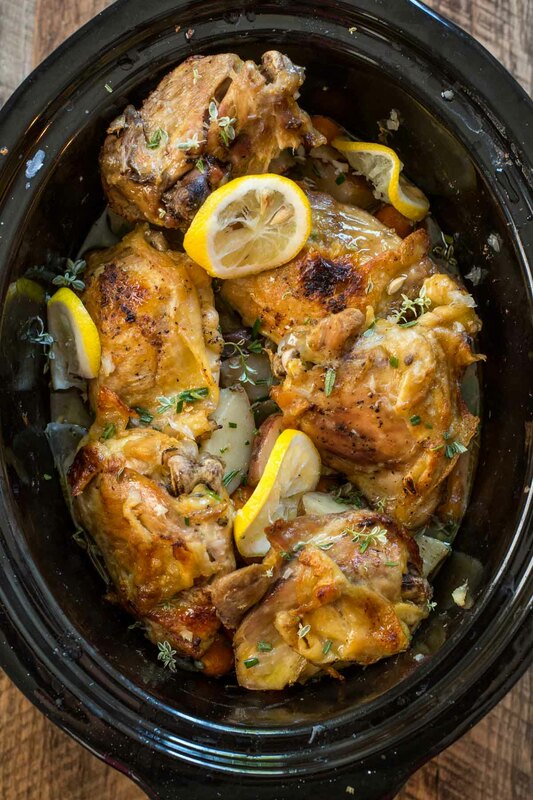 You can place the chicken in the slow cooker raw, just make sure it’s not frozen! I stumbled upon this delicious looking recipe earlier today. It’s in the slow cooker right now and smells so good. Can’t wait for dinner tonight! I used skinless boneless chicken thighs, and following the recipe as written. 1. We added 1 cup of chicken broth to add moisture. 2. It really needed more salt – I thought I was being heavy handed, but I will add more next time. 3. I didn’t bother with the browning in the oven step and it was still great. 4. I would probably cut the potatoes and carrots by 1/4 of the amount each and add more onion. There seemed to just be too many potatoes and carrots ratio to chicken. 5. I’m thinking either the lemon juice or the lemon slices, but both seemed slightly overpowering. When the chicken is done in the crock pot and it says to preheat the oven so the chicken is crispy it doesn’t say to what temperature. What should I preheat it to? I just use the broiler! No need to preheat to a certain temperature. The directions say broil – so I would use low since the meat is already cooked. Just stick around and watch as the broiler can be tricky at times. I’m going to make this next week and will report back. I am making this for dinner tonight. Thank you for the recipe, I however did use russet potatoes. And orange slices cause 8 didn’t want to go to the store. That should be ok right? Hi there! I apologize for the delayed response. I hope the chicken still turned out great for you! I loved this recipe! I love the fact that everything is natural. My sister was just put on a low sodium diet and this was the perfect recipe for her. Everyone absolutely loved it! I am so glad! Thank you so much for taking the time to come back and let me know! Trying it tonight. Can’t wait! If you were to make this with boneless chicken breasts, how many breasts or how much should the breasts weigh? I’ve noticed that some recipes change the wgt. of the chicken breasts when substituting for chicken thighs. Thank you. I would just use a standard package of 1-1.5 lbs. chicken breasts. I would also probably skip the broiler part at the end of the recipe to avoid drying them out. Came across this recipe this weekend and just made in the oven — this is excellent! So glad that I came across this site – Thank you so much for sharing this!! I have 6 quart crock pot. Is this too big for this recipe ? No that should work great! Thanks so much for the amazing recipe. I made this and my husband couldn’t believe it’s home-cooked! So sorry to hear it didn’t work well for you!When you say the lemon destroyed the vegetables do you mean it was just too strong? I’m cooking this now…do I need to make any adjustments for boneless skinless thighs? Love the idea of this, but not a fan of dark meat chicken. How would I adjust the cooking time if I used bone-in chicken breast? Thank you. The cooking time should be about the same with chicken breasts! Love this chicken! I have made this twice already and everyone loves it. I use the skinless thighs, I brown them first. I found 5 hours on low is more then enough. Last time did the 7 hours and it was a bit too much. I also add a cup of chicken bouillon. Lately I’m tired of stuff I have tried making like pot roast, turkey,pork, it always comes out tough so now trying new recipes. This is a keeper. I also use the Near East Couscous Couscous with wild mushroom and it’s excellent!! The smell of this cooking for hours is so great, thanks for this recipe. I’m so glad you enjoyed it! It sounds wonderful with the couscous! I’m trying it with boneless skinless thighs hope it turns out OK. Have you done it with boneless skinless? I haven’t, but I think it would still work fine. I hope it turned out great for you! What will happen if you use frozen chicken? Technically, the USDA doesn’t recommend using frozen chicken in the slow cooker. I think it would work okay, although the texture if you use skin-on chicken thighs might be off. I made this recipe on lunch and the house smells great. Can’t wait to try it for dinner! You have one small typo- at the end, I think you meant broileR not broiled. What if I don’t have a broiler ? Can i bake to get the same texture on the tops of the chicken after they have slow cooked ? Baking would probably help crisp up the chicken, but I’d be a little more concerned about drying it out. I would just try a really hot oven for a short amount of time. I have read that for safety you should never reheat chicken but eat it cold if you have leftovers. Is this a true statement? As a bachelor, there’s two things that I appreciate. A slow cooker, and awesome people who share recipes for the slow cooker. Cheers on the awesome recipe. I appreciate you taking the time to come back and comment! So glad you liked the recipe! Tried it last night was amazing thank you for sharing this amazing recipe ! Hi I made this with sweet potato but when I served it the potato was still quite hard. So were the carrots. It have been cooking on Auto for 8 hours. Any tips? Would some extra chicken stock help? Im new to crock pot cooking. Hmm…the vegetables definitely should’ve been soft after cooking that long. I’m not familiar with the “auto” setting. My crock pot just has low or high. Is it possible that setting isn’t warm enough? I don’t have any potatoes on hand. Can I make this without any potatoes using the same cooktime? I do have couscous on hand. Do you cook the couscous together with the chicken or separately just before serving? You can definitely omit the potatoes. I would cook the couscous separately right before serving. 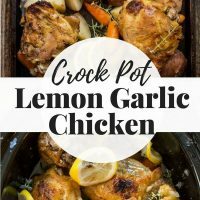 Just tried this tonight and all I can say is YUMMMM.. Great call on broiling the chicken after cooking turned nice and crispy. Will look forward to having it again tomorrow after it sits overnight. Keep up the great work and looking forward to trying more of your recipes. This makes me so happy! I’m so glad you liked it and I hope you find many more recipes to enjoy!